Are you into healthcare innovation? 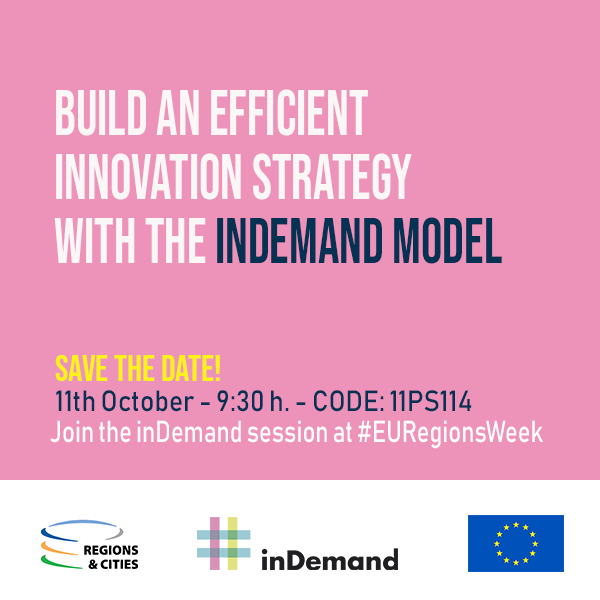 Join the inDemand session at #EURegionsWeek in Brussels! We will be talking about bottom-up, demand driven co-creation for sustainable territorial development. Would you like to open a gateway to building an efficient innovation strategy? Would you like to learn how to deliver sustainable impact and investment in your region? Join our session built around inDemand, a H2020 funded project, the 11th of October. We will promote a new, innovative bottom-up, demand-lead model where healthcare organizations identify real needs and jointly with tech companies co-create eHealth solutions, with financial support from regional funds. Following inspiring presentations by European Commission officials, participants will have the opportunity to engage in discussions with regions that test and validate the model. inDemand has a high potential for replication through a community interested in promoting innovation in health and in other sectors, although the project will test and develop models only in the health sector. Why is this model innovative? inDemand applies at the same time demand-driven and co-creation approaches. Know more about the inDemand model.